The new anime series Skyland is everything you want from this genre, action, intrigue, battles and classic good versus evil in an almost David and Goliath epic struggle. Although the premise of Skyland is rather dark, the animation really gives the series a hidden light as if one is looking into a diamond with a thousand different possibilities. Set in the distant future, 200 years to be exact, the Earth as our little analogy above has been split into millions of different blocks, with many still supporting life, thanks to a new breed of humans called the Sejins who have the ability to absorb sunlight to the fuel their super human powers of telekinesis and telepathy. Although human life is still in abundance in the future, a dictatorship called the Sphere is controlling the most important resources for the Sejins, water which are enforced by Guardians. Rebellions have risen in the 23rd century in order to overthrown the Sphere and caught in the middle of this horrendous battle are Mahad and his sister Lena who are exploring the various blocks as they discover new civilizations where the hand of the Sphere has not tainted these amazing lands. Apart from Mahad and Lena in the series, another main character is Oslo, the Guardians leader who has harnessed the ability to use his powers in both light and darkness as he attempts to thwart these rebellions. 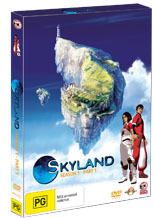 Featuring pirates, amazing locales and monsters, Skyland Season 1 - Part 1 is a truly inspiration vision that is not your traditional clichéd and half naked anime storyline of young school girls... no... Skyland is far from this... it's modern fresh storytelling at its best with first class animation and CGI.